Scuba diving hand signals are the basis of communication for this sport. All divers, from beginner to the most seasoned experts, know that this is a team sport. “No one dives alone” is the maxim on which rests the dive buddy system. But this system would not make sense if, once submerged, you have no way of telling your partner the direction you want to take, if you have any physical problem or simply, that it is time to finish the dive and ascend. So, unless you have a very expensive underwater voice communication system, scuba diving hand signals will be your communication tool. Yes, it is true, when you find the perfect dive buddy and after many dives together, it is common to develop your own system of signs. Until this happens, it is essential you know these 15 basic scuba diving hand signals. Thumb Down, The Scuba Diving Hand Signal to Indicate That The Fun Begins. It is curious how this scuba diving signal, which on the surface has a negative meaning, can fill a diver with excitement and joy. After the surface check-up, thumb down indicates the dive begins. This signal can be complemented by placing the thumb down over the other hand’ palm extended horizontal. This is to indicate you are going to descent to a specific depth whose number must be indicated with the fingers. Scuba Diving Hand Signals To Indicate How You Feel. 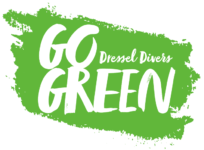 When scuba divers reach the depth desired and during the rest of the dive, it is important to know how your dive buddies feels. To perform the Ok scuba signal correctly, make an “O” with your thumb and the index finger. This diving signal is both inquires\ if everything is OK and to respond when all is right. However, if there is any complication, it should be indicated to your partner as well. This is done with the palm of the had open, downwards and fingers spread, make it shake. After that, you should indicate what your problem is. If you have cold, you should hug yourself, putting each of your hands over the opposite shoulder. When you cannot compensate correctly, point with your finger at your ear. Scuba Diving Hand Signals to Indicate Direction. Generally, all smaller problems are resolved at the time without complications. So, we can go on enjoying the dive. To indicate the direction in which we are going to move forward, we will again use our thumbs. We will use the right or left thumb depending on where we want to go, similar to when hitchhiking. Sometimes it is necessary to change the direction. The proper scuba diving signal you have to use for this begins with the index finger extended, pointing straight up and moving in circles. After that, you should indicate the direction in which you are going to continue advancing. On the other hand, if we want our partner to stop, we will confront him or her with the palm of our hand raised vertically, similar to a policeman stopping traffic. If you have located an animal and you want to draw the attention of your partner to it, the correct scuba diving hand signal starts by your pointing at your own eyes with your index and middle fingers. Then, indicate the direction where the animal is. 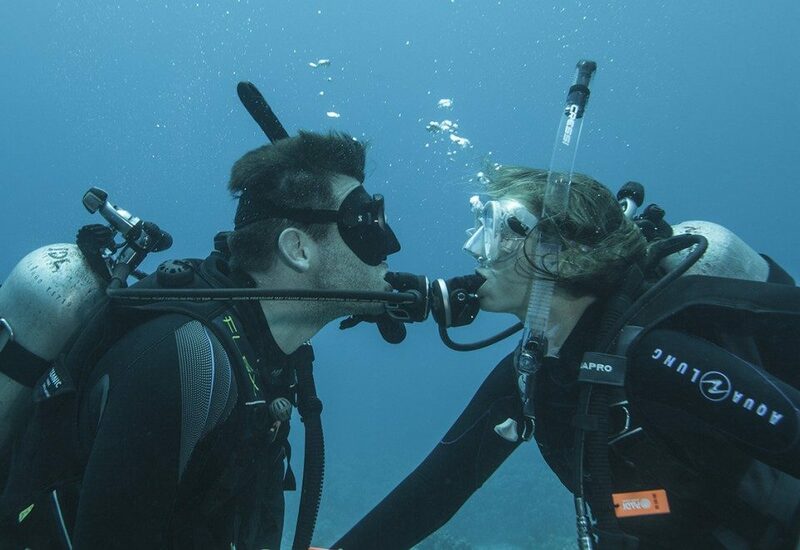 Another possibility is that your dive buddy is too far away from you and you need him or her to come closer again. Moving the arm and the palm of the hand towards you is the correct way to say: Come closer please!! 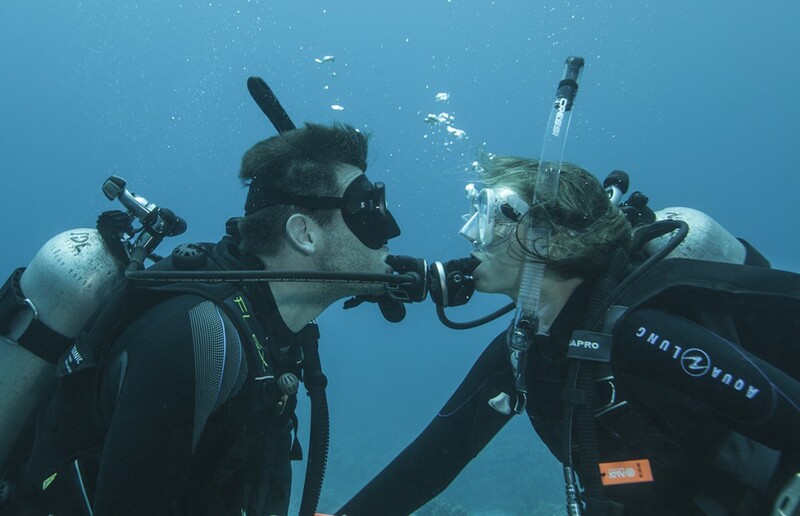 Frequently, instructors or Dive masters are the ones to realize a couple of dive buddies is too separate. If they put their two index fingers together in parallel, they are requesting: “Please do not detach from your partner” “Keep on together”. Probably, the scuba diving hand signal for “cancel” is the least used of all given the practice of this sport has a high level of safety. However, it is necessary to know it, even if you will likely never need it. It consists in crossing your arms over your chest with the hands closed. The dive advances, but the time we have to enjoy is limited by the air in our cylinder. For this reason, the next signal is performed several times throughout a dive. We are talking about how to ask how much air your dive buddy has left? There are two ways to do this. The most common is to point the gauge with the middle finger and the index finger. The second way is to point in exactly the same manner but to the outstretched palm of your hand, instead of the gauge. As you will know from the scuba briefing, there is a previously determined point of tank pressure, called reserve, which indicates there is little air left. When this time is reached, closing a fist in front of your chest will indicate you are entering reserve. Your dive buddy will reply with the “up” signal and the dive will be ended.Enjoy this video with the 15 scuba diving hand signals we mention in this article. The Scuba Diving Hand Signal to Indicate the End of The Dive. 15. Although the dive time is never enough for us, we need to finish it properly and using the “ascend” scuba diving signal in the correct way. To indicate this, we must place the thumb-up. Take care not to confuse this signal with the one that indicates OK, during the dive. 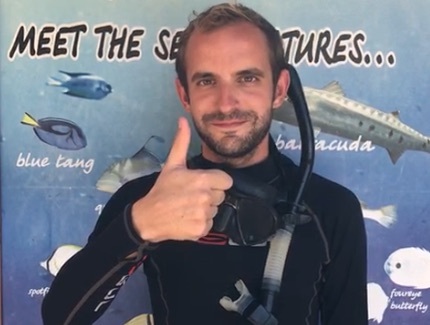 Under water, thumbs-up indicates something very different from what we are used to on land and mistakenly using it to say you are OK could end the dive prematurely. You would not want to ruin a dive because of a simple oversight, would you? 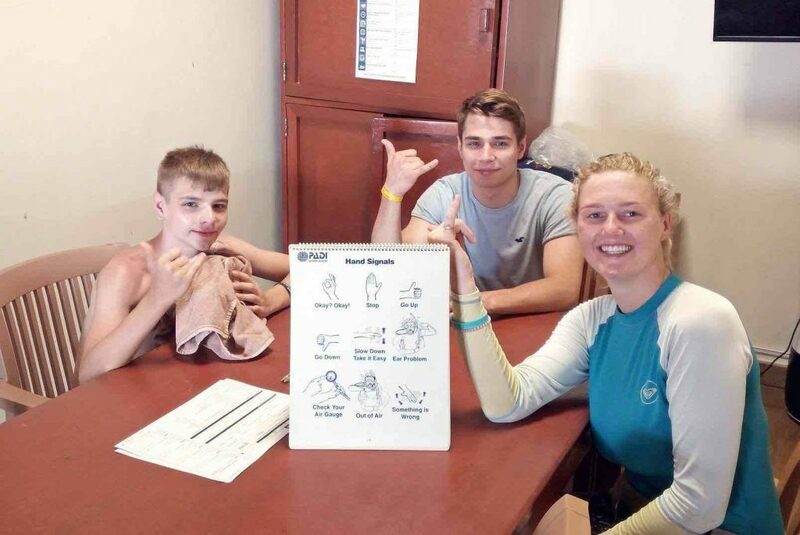 It is important that you perform these scuba diving hand signals with precision and the right speed or it is possible you will not be understood. 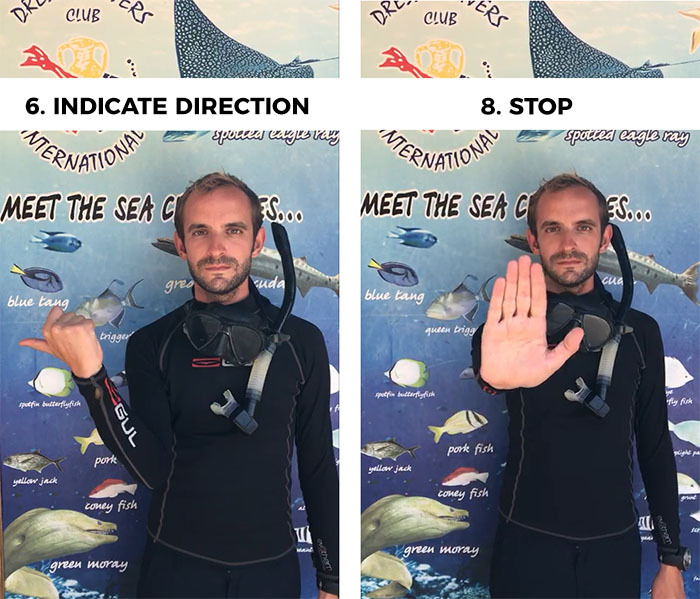 Don’t worry if you have not dived before, because during your PADI dive course, these and other scuba diving hand signals will be explained by your Dive Instructor in detail. Also if you have not dived for some time, it is recommendable you do a scuba review which will include a revision of the hand signals.